I just got the Gingersnaps Celebrate set that I've been wanting for a while and couldn't wait to play with the cupcake image! 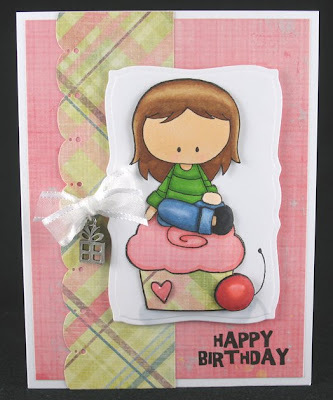 I paper pieced the cupcake with this perfect piece of double-sided patterned paper from Fancy Pants to look like the inspiration cupcake and used the same paper for the rest of the card. Unfortunately some of the dimension doesn't show up as well because I shaped the pieces to be more rounded and realistic so a lot of the edges are actually sitting kind of flat. 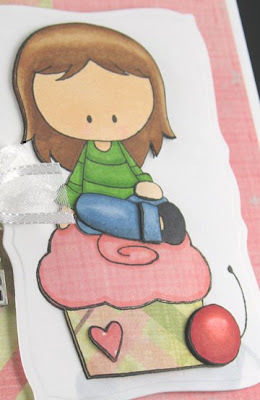 Just so you know what to look for, I popped up: the girl with an extra hand, extra front leg, and extra pants cuff; the whole cupcake with an extra heart and extra cherry. I hope you like it and TFL! Other materials used: border punch - Martha Stewart; Copic markers; curved rectangles Mega Nestabilities - Spellbinders; ribbon - May Arts; charm from stash. OH! Cute Cute Cute! Perfect cupcake/wrapper/cherry! It is perfect for the challenge, thanks for playing! OMG This is just adorable!!! Ooh..this is such a cute card! Pretty card! Woo hoo on being top five on the challenge!